Mechanical sampling is the process and equipment used in collecting samples by using a mechanical device. It is also called automatic sampling and usually involves automatic equipment collecting sample cuts (increments) at regular intervals from the main stream of material. If required, these increments may then undergo further stages of division, crushing and analysis. Sampling is normally done where a stream of particles is flowing past the sampling point. Most mechanical samplers are installed at conveyor belts, or in chutes, or pipes carrying the material. The samples collected are usually analysed in a laboratory to determine the material properties. Determine the quality of run of mine material. Monitor processing of materials in beneficiation plants such as a coal washery, sinter plant, or refinery. Determine the quality and value of a material at the point of sale. This is often at a terminal where ships are being loaded or unloaded. QHS Mechanical Samplers can range from a small sampling device in a chute sampling a flow of a few tonnes/hour to a major export terminal where there can be a number of sampling systems operating at flows over 13,000 tonnes/hour on conveyors 2,500 mm wide. These larger systems have 3 or 4 stages of sample division (primary, secondary, tertiary, quaternary samplers) and 1 or 2 stages of crushing. "Each particle must have an equal probability of being sampled regardless of its properties or position in the stream." A proper sampling device will normally be driven at a constant velocity through a stream of particles collecting a sample from the full cross section of the stream. It must operate at regular intervals throughout the whole lot of material and collect a proportional mass of sample from each portion of the lot. No sample material shall be lost from the sample stream and no foreign material shall enter the stream (e.g. water and dust). No significant change to the samples in the properties of the material to be analysed (e.g. no moisture loss). Most modern particle sampling theory is based on the work done by Frenchman Pierre M. Gy in the 1950's, 1960's and 1970's. His studies established the basic rules for sampling particulate materials which are the basis of today's sampling standards. There are numerous ISO, ASTM, BS, AS/NZ, JIS, CEN/TS, etc. standards covering the sampling of particulate materials such as coal, iron ore, concentrates, alumina, aggregates as well as generic standards. The requirements of these standards are often similar with the main differences being sampling rates and material properties. 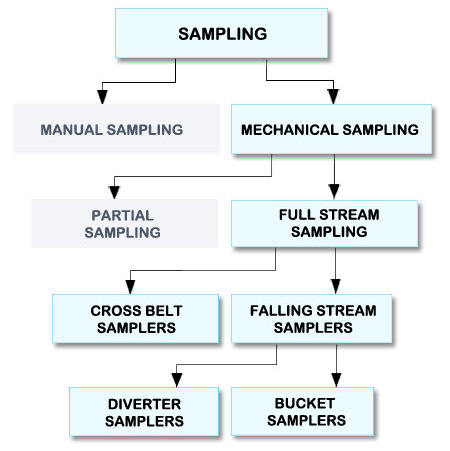 The chart below shows the various categories of sampling devices. Manual sampling is usually where the sample is collected by hand with a scoop. There are often problems with safety and sample accuracy. Often the samples are not taken from the full cross section of the stream. Partial Samplers are devices that do not sample from the complete cross section of the particle stream. They are typically Probe or Scoop Samplers which sample from only one part of the stream so they are not considered proper sampling devices. These are often used for sampling powders and slurries in locations where the particles are expected to be well mixed and not segregated.